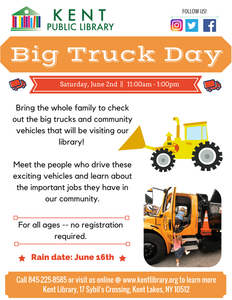 Big Truck and Community Vehicle Day Saturday, June 2nd 11:00am- 1:00pm Kent Library's parking lot will be filled with construction trucks from the highway department, a police car, fire engines and more! Families are invited to touch, climb on, and explore these impressive vehicles in a supervised environment. Children may even get to honk the horn! Meet the people who drive the big trucks and police cars, and learn about the important jobs they have in our community. Come into the Library when you're done looking at the cool trucks and make a fun craft! This is an especially fun program for young children. The rain date is June 16th. No registration needed, just stop by! The library is located at 17 Sybil's Crossing, Kent Lakes, NY 10512.